This Manor house built in 1801 is the perfect place for a relaxing family holiday. It will comfortably take three families and with seven acres to roam in. There is always the possibility of finding somewhere quiet and peaceful. 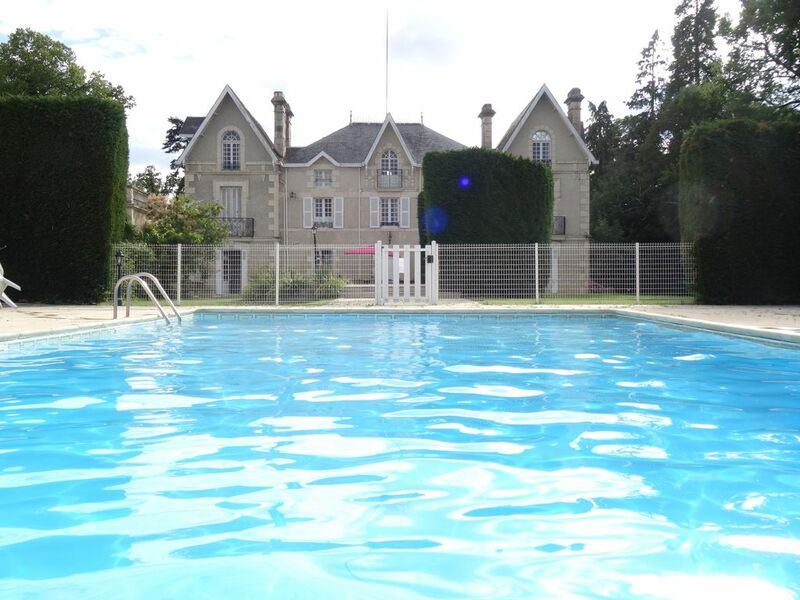 In the grounds there is a private swimming pool and an older hard surface tennis court. The grounds go down to the river where you can canoe and fish. Inside the house there is a fully equipped kitchen, large dining room and separate lounge both with open fireplaces for winter comfort. There is also a utility room and downstairs WC. There is a Manager, speaking English & French, living a few miles away who will help out with any problems or emergencies. Local ameneties: Although the house is in a quiet rural location, it does not take long to get to the local towns which offer good shopping and eating facilities. A little further away is a golf course, Le Manoir de Beauvoir. Also available is fishing on a lake behind the house with consent of the next door farmer, can be arranged via the Manager. There are markets on in all the local towns each on a different day of the week, all offering lots of local produce. For a full day out you could aim for the beach at La Rochelle it will take about 2 hours via Poitiers. Also there is Futurascope which takes about 40 minutes by car. If you are here on the 29th of any month there is a market at Les Herolles - it is one of the eldest in France said to date back some 500 years, it is well worth a visit and I promise that you could buy anything from a loaf of bread to a tractor and of course a donkey and a couple of geese, it takes about 15 minutes to drive. For the more adventurous a TGV goes from Poitiers to Paris taking about 90 minutes. Free internet is available however the system will not cope with streaming! Internet is good on the ground floor, not on the upper floors or in the pool area. Condiments and spices can be found in the kitchen, there is usually a good supply of tea bags including fruit teas. Please provide your own coffee however there is some filter coffee and sugar cubes. Dining room and drawing room are suitable for large groups to eat together there are no doors between these rooms. There is also outside seating tables for 20/24 people. We had a great time staying at the house. It was a perfect choice for our large family get together & the facilities, particularly the pool, tennis court, outside space (and weather) were excellent. Also, thanks for all the information provided prior to the trip. We were so very pleased with the outdoors of this property. The swimming pool was a good size and accommodated us well. The outdoor furniture was lovely and plenty of seating for us all. The tennis court was more than good enough, and got lots of use. We took a work group of eleven people to Manoir du Cervolet and we loved it. The cooking and entertainment facilities were in good shape and this Manoir would be ideal for families. The tennis and pool were a particular hit and were well used by our group, and the setting is great for walking/ running. The owners arranged for some excellent catering for one of our nights and it the services (including towels) were all top notch. The location is very close to the historic, picturesque town of Montmorillon and we had a great evening there. Toujours un aussi bon accueil et d excellentes prestations, lors de notre second sejour. A 24 dans le manoir, nous ne nous sentons pas a l etroit. Endroit à recommander. Thank you for your kind words. We are so pleased you and your family and friends once again enjoyed your holiday at the Manoir. You and your family and friends are always welcome to our house. Je vous remercie pour vos aimables paroles. Nous sommes ravis que vous et votre famille et vos amis aient de nouveau apprécié vos vacances au Manoir. Vous et votre famille et vos amis le font toujours dans notre maison. Nous étions 10 couples d'amis et nous avons passé un très très bon weekend. Les photos parlent d'elles mêmes. L'endroit est magique. Environnement calme et boisé petite rivière en contre bas. le jardin est bien entretenu. Les chambres sont confortables et très propres. Il y a suffisamment de salle de bains et de toilettes . La cuisine , bien équipée, est un peu petite mais ce n'est qu'un détail. Détente assurée autour de la piscine et le terrain de tennis est tout a fait praticable. je recommande vivement cette location si vous voulez passer un week end calme et festif en même temps. We are really pleased you had a wonderful time, thank you for your kind comments and we hope to see you again. Nous avons passé une excellente semaine entre amis avec des enfants en bas âge. Les propriétaires ont très gentillement équipé la maison avec barrières, chaises enfants, lits bébé. L'endroit est parfait pour passer des vacances en groupe tout en gardant de l'espace pour chacun tant à l'intérieur de la maison que dans les extérieurs. En bref des vacances très réussies merci beaucoup ! Nous sommes vraiment heureux apprécié notre maison et fait des souvenirs de vacances. Nous espérons vous revoir bientôt. The Manoir is situated between 2 rural villages. It is about 45 minutes from junction 15 on the A20 and in the other direction about 45 minutes from Poitiers which offers an International airport and major railway station with TGV connections to Paris. It takes approximately 6 hours from Calais. Rates are subject to change until the booking is confirmed. Additional charge for heating the pool in summer or heating the house in winter. Pool is closed between October and Easter. Last minute bookings please contact owner for best rates.